Data Republic’s Software Engineering Manager talks technology, collaboration and team management. Eduardo Rodrigues has been with Data Republic for over 2 years as a Software Engineering Manager, where he has led teams to experiment with the best technologies in the development of the Senate Platform. So we decided to sit down with him to talk about his approach to managing teams in terms of TECHNOLOGY and PEOPLE. For over 20 years, Eduardo has worked in different segments across the IT industry leading teams and working with innovate technologies. Having once owned his own consultancy company and startup, coming to Data Republic represented an opportunity to be involved in the startup world again. So he took on the role of Software Engineering Manager, where he would manage two teams in the development of the Senate Platform. The core team is responsible for the building blocks of the Senate Platform, and the Senate Matching team works on a solution for protecting customer PII, launched in November 2018. Day to day, his role requires tackling the challenge that is working on a ‘greenfield’ product, where there are no industry benchmarks in place. For Eduardo, this is one of the highlights of the job because it enables him to experiment with different technologies, languages and infrastructure solutions in order to problem solve. The ‘greenfield’ means knowing where the company wants to go but not exactly how to get there – this part requires constant problem solving from the team. Eduardo describes Data Republic’s approach in giving its employees the freedom to enlist the best technology for the job. When it comes to managing the teams of people, Eduardo says this means everyone has a say. There are a range of people from diverse cultures who all work differently and have different expectations, but Eduardo is passionate about bringing his team together and considers how he can make them all feel at home. Through regular scrum meetings, and team bonding exercises he says communication has become quite free. The open space of the office allows him to easily communicate with other teams, and stretch himself beyond the ‘dev corner’ that can easily become an exclusive place. 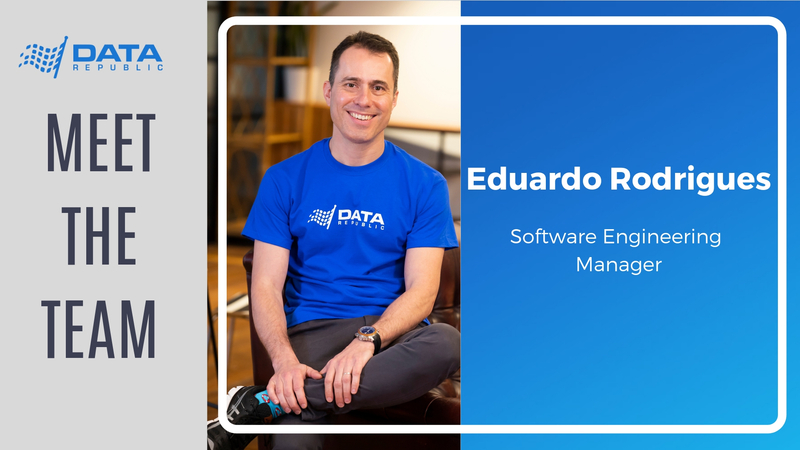 Eduardo is passionate about working in startups and considers Data Republic a great opportunity due to the group of bright and driven people that are involved. Want to work with great people like Eduardo? Check out our careers page to find your role.